Into the Elizabeth City dock around 9:30 this morning, unloaded and unrigged Spartina, lunch with my friend Millie, and now time to start cleaning gear. It was an excellent trip. 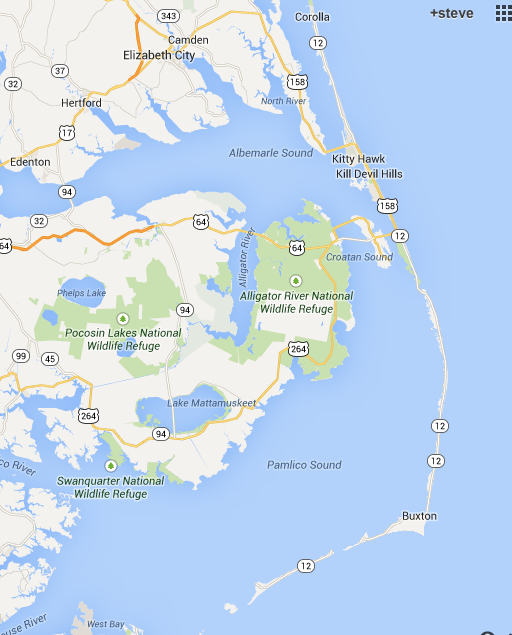 Peter Mashoes Creek, where Croatan Sound opens onto Albemarle Sound. Strong NE wind which should carry us tomorrow NW to the Pasquotank River. Anchored for a swim on a hot afternoon. Soft shells for a late lunch. I'll have fruit and cheese for a light supper anchored out in the creek. Made it across in a couple of hours. Hospitality here is great. Good to be back on the island. Still using my old copy of the Watertribe equipment list. For this trip I used the green "OK"
Notice the fishing poles and fish cleaning board. We can all have a dream, can't we?? Series of storms rolling across Virgina and NC now. air coming in with a nice NNW breeze. The press release from the Chesapeake Bay Maritime Museum in St. Michaels, Md. 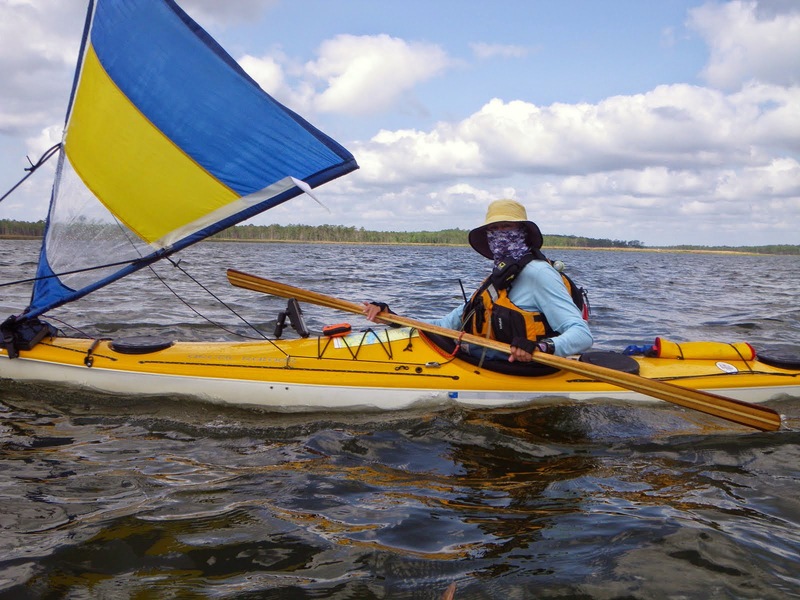 refers to her as Kristen Greenaway, but readers of this blog and followers of the Everglades Challenge might know her better as "Kiwibird Kayaker." I guess we can all now refer to her as Madam President since she has been selected to be the new president of the prestigious maritime museum. How great is that? 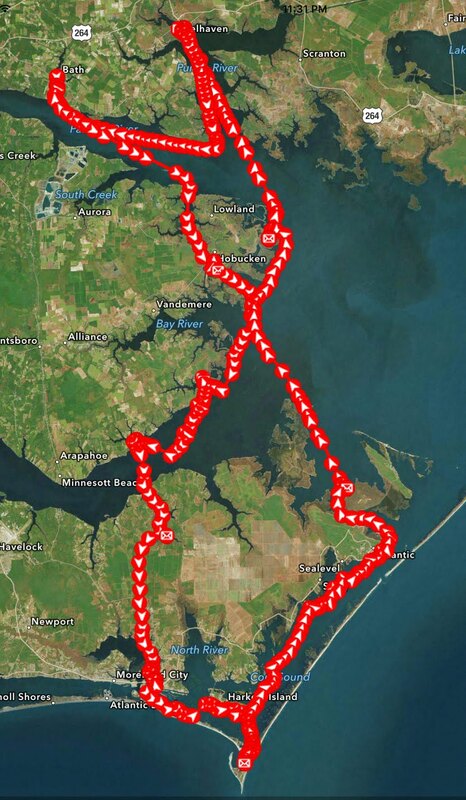 I came across Kristen through emails and blogs six or seven years ago as I was finishing the build of Spartina and thinking about cruising. 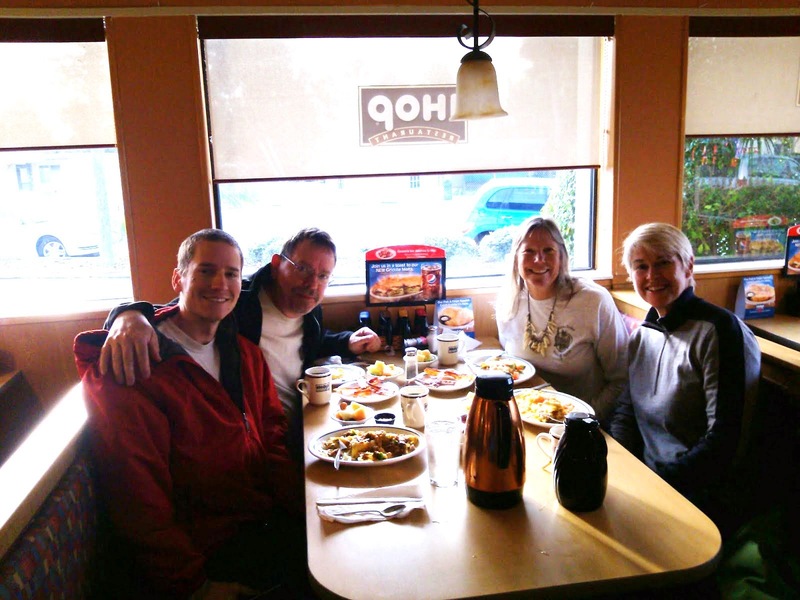 Kristen, at right in the photo above, and Dawn, seated next to Kristen, were training for an Everglades Challenge and I began following both of their blogs searching for ideas and equipment for spending time on the water in small boats. They, along with Paul and Alan, at left, gave me countless tips, thoughts and suggestions. Soon I was emailing Kristen for advice, which she provided for everything from SPOT tracking devices, sleeping bags, thermals, buffs and, recently, solar powered inflatable lamps. She even clarified for me, you'll see if you scroll way down in the comments here, the boatbuilding efforts by Gibbs on the television show NCIS. Kristen is one of those friends, there are many I've made through this blog, that I have never met in person. 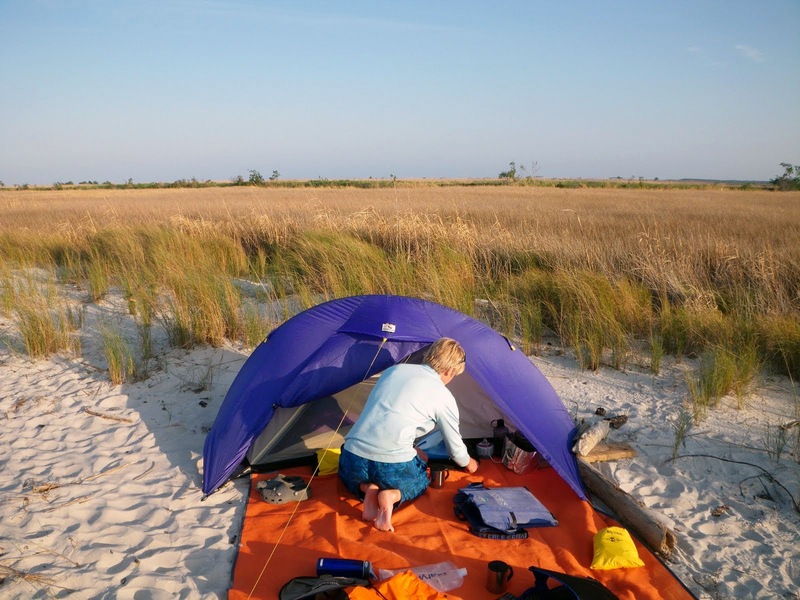 The closest we came was a few years ago when she and her paddling partner Dave camped on a sandy little beach on the Pamlico River. 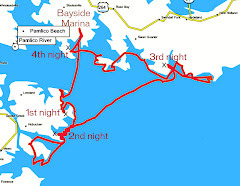 I came by a few days later, anchoring for a swim off of the beach and recognizing the tracks from their kayaks and camping gear. 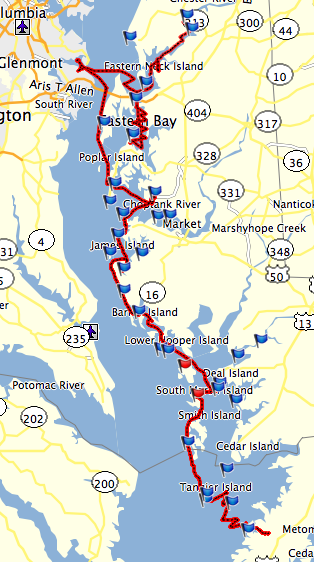 Maybe now that Kristen is headed towards Chesapeake Bay maybe I will get to meet her in person. 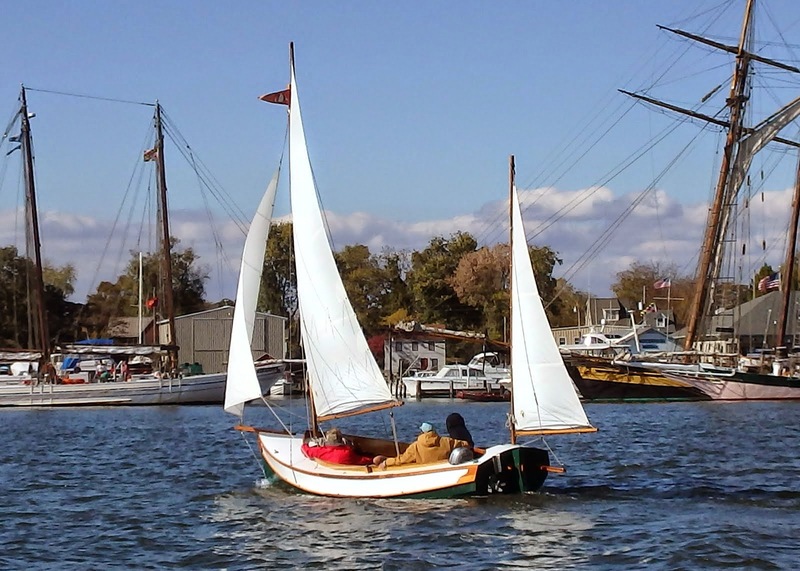 The Chesapeake Bay Maritime Museum is 18 acres of Chesapeake Bay history, captured through classic boats, crab shanties, modern displays, boat shops and even a lighthouse on the St. Michaels waterfront. 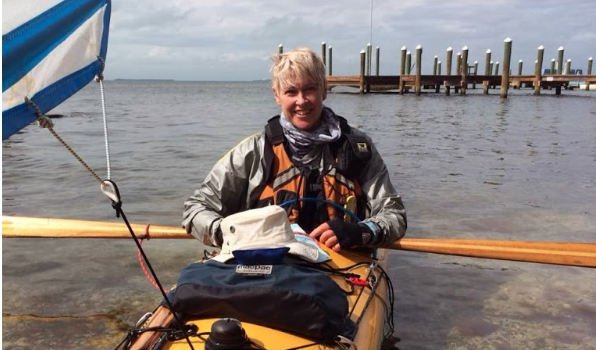 Read Kristen's bio on the press release and you will see she has a life-long passion for the water, from living on a boat in her Kiwi youth to ocean sailing and now expedition racing in kayaks. 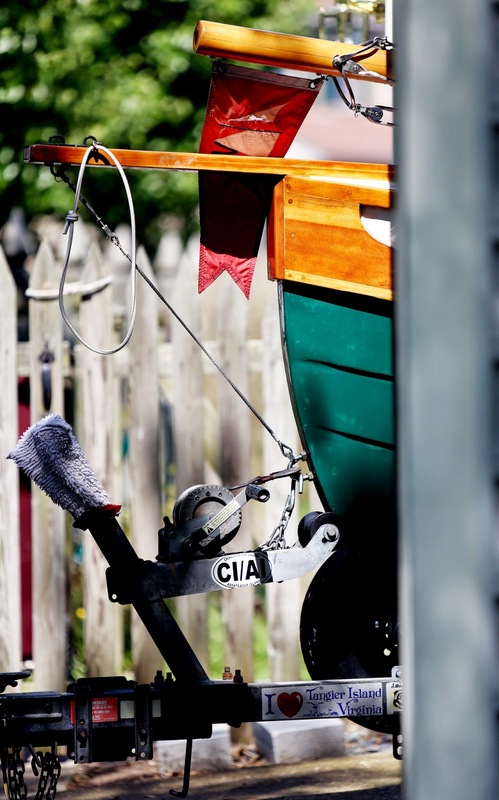 I can't wait to see what she does when she brings that passion to the Chesapeake Bay Maritime Museum. The wife has turned over her side of the garage (Spartina inhabits the other side) as I set out my gear and supplies for the trip. 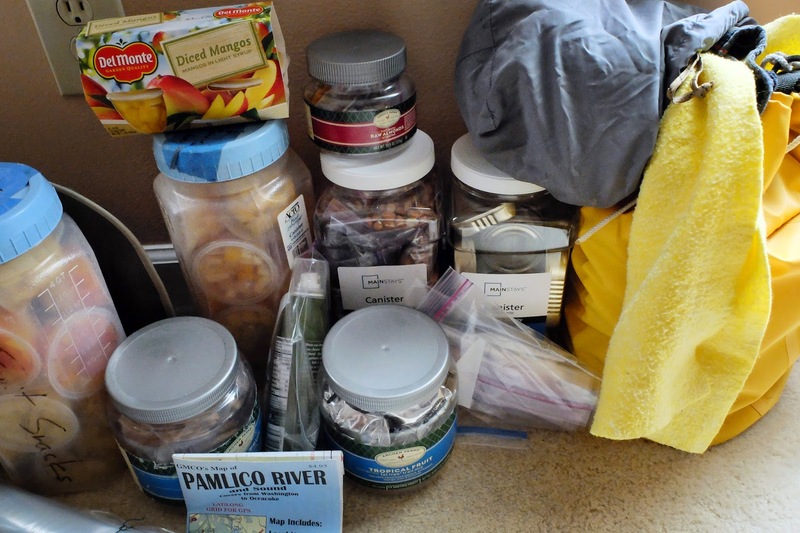 Lots of little errands to run: fill the gas can, bottle of spray olive oil for cooking should I catch a fish, a two of bottles of liquid treatment for the portable head, new notebook, bottled water, etc. Kind of fun to do it all, makes me feel like I'm on vacation even though I've got a couple of more days of work. I've enjoyed following Webb on his yellow brick track. I've marked his approximate position on a screen shot of the earth wind map. Below is the "last known position" (which I suspect he labelled with a smile). 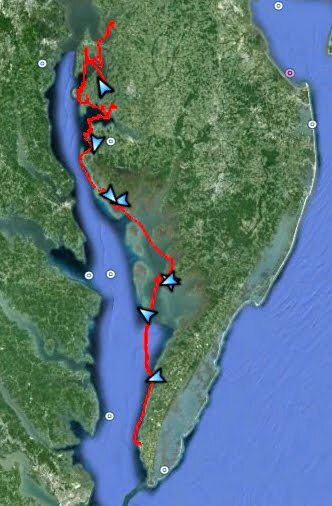 The earlier data showed that Webb was correct in predicting a slow departure from the coast, making just 1.7 knots when his first position was marked yesterday. Offshore he has since been moving at around six knots. His heading is SSW, which I suspect will continue for a couple of days before he turns west. The forecast looks good for the start of my trip. Wind out of the N or NNW for the first couple of days, comfortable temperatures. I wish I could leave today. Webb Chiles has cast off. You can see his yellow brick track here. And here you can read his most recent journal entry, which is filled with joy. 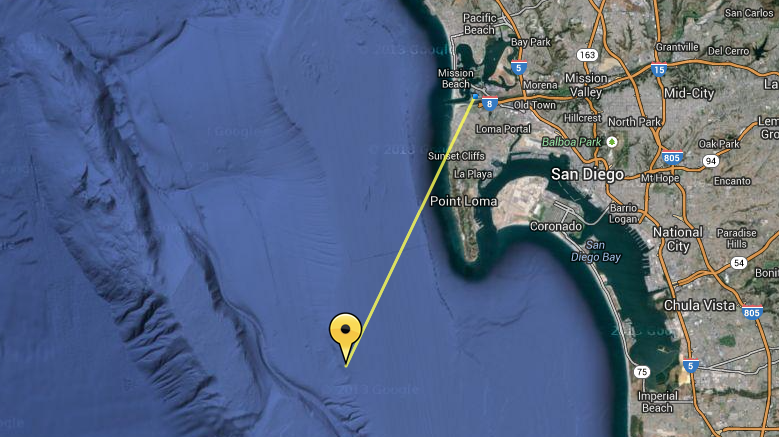 The track shows a speed of 1.7 knots. 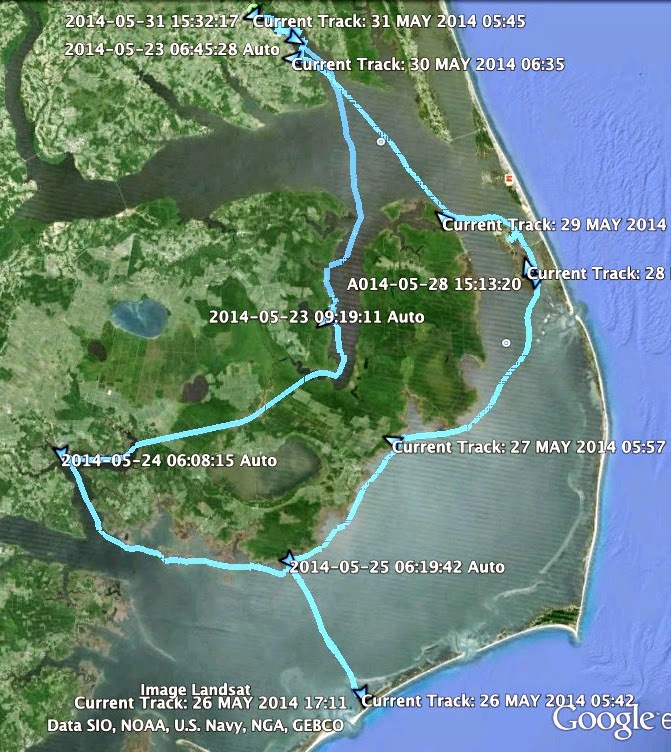 Webb had expected less than ideal winds as he left, hoping for better winds offshore. He had told me the route to Hawaii is not direct, but rather heading south and then turning west following the winds. 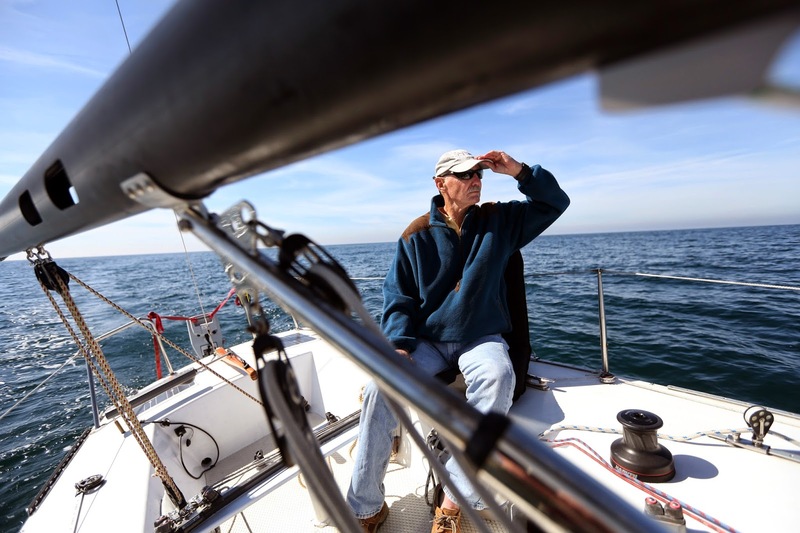 A sixth circumnavigation, a 24 foot boat and a sailor 72 years young....pretty cool, don't you think? Walking along the Elizabeth River this afternoon I ran into my friend Daniela who was working with the Sail Nauticus boats. 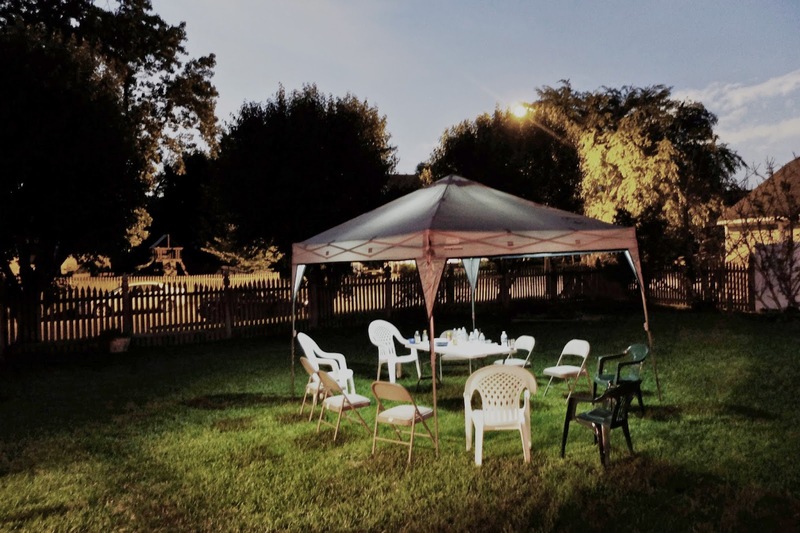 It was a beautiful evening. Daniela mentioned that she is leaving in a few days to help crew on a offshore boat sailing to New York. 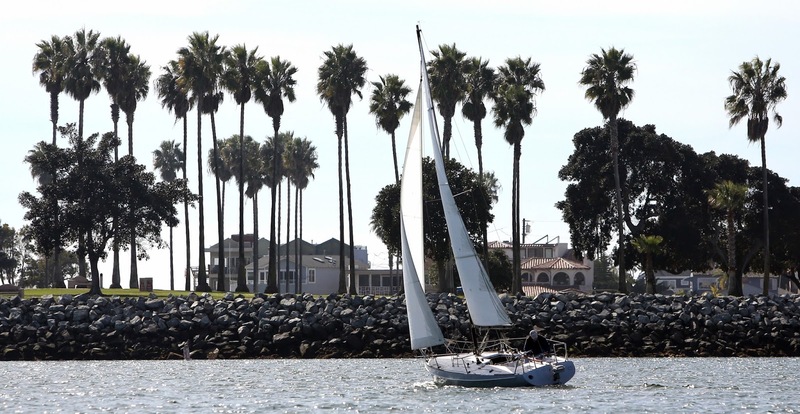 And I received an email from Webb Chiles telling me that he may leave tomorrow morning, casting off from San Diego's Quivira Basin bound for Hawaii and New Zealand on his Moore 24 GANNET. 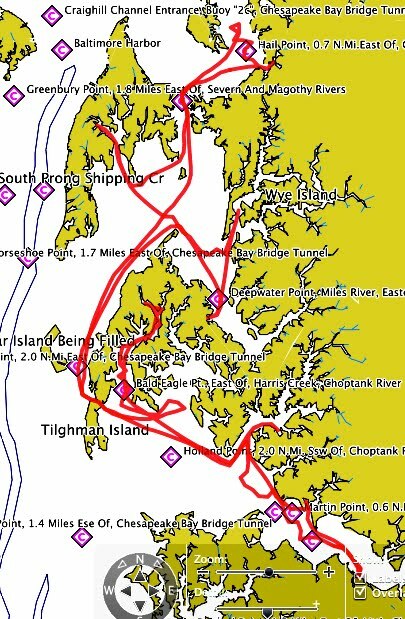 It must be a good week for leaving - I will be launching out of Elizabeth City, NC for ten days on the sounds, rivers and bays of the Inner Banks. 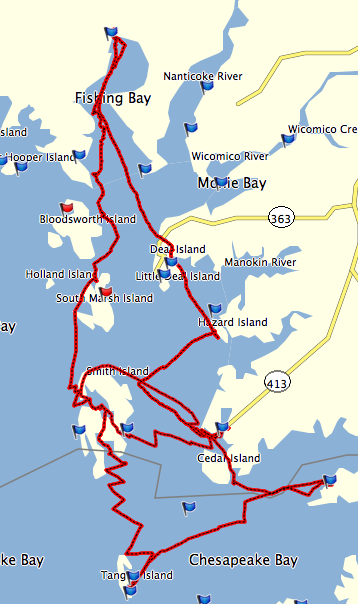 The forecast, as of now, calls for NNW wind at 10 mph, just right to push me down the Pasquotank River, across Albemarle Sound and up the Alligator River. 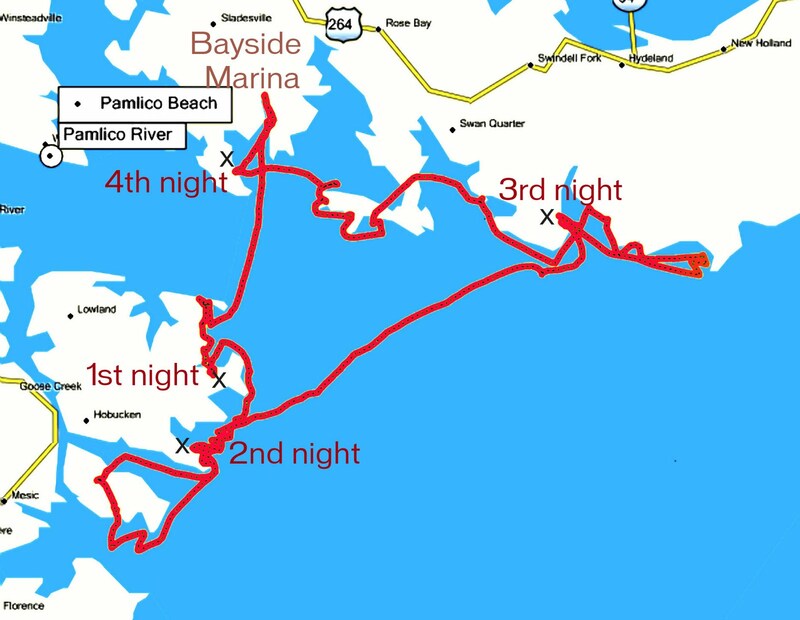 Wouldn't it be nice to make Rattlesnake Bay that first night? It's kind of like photographs of Sasquach, the hominid creature said to live in the forests of the Pacific Northwest. There are only blurred images that might show the animal, or maybe just where the animal had seen. Fleeting moments that hint of something that may, or may not have been. There is a beer koozie on the table outside, an image of a pirate on one side and a built in beer opener on the other. 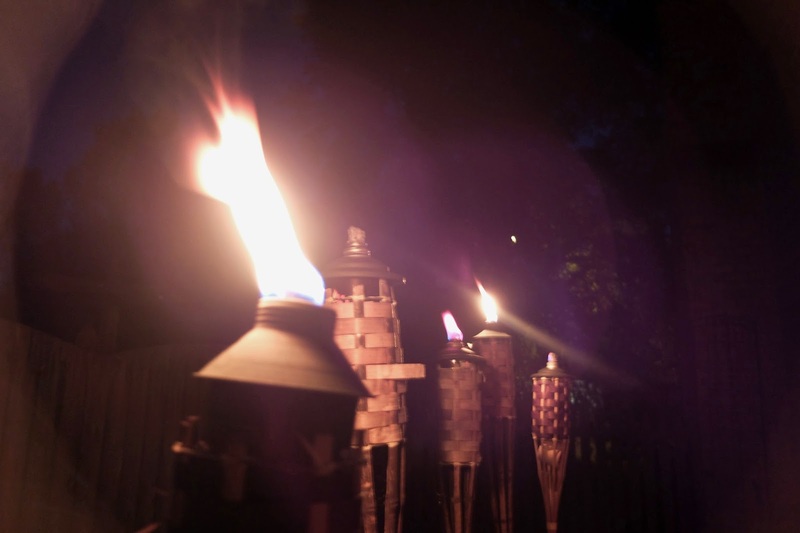 There are burned out torches in the garden, plastic glasses with dried red wine on the lawn. I remember a lot of laughter, people arriving in summer clothes carrying chips, cakes and bottles of wine. There were kids running in circles and a dog or two sometimes in the chase. Friends old and new. A mixture of Delta blues, zydeco and southern rock from the seventies on the stereo. If you are having crawfish you gotta have a little Buckwheat Zydeco mixed in. 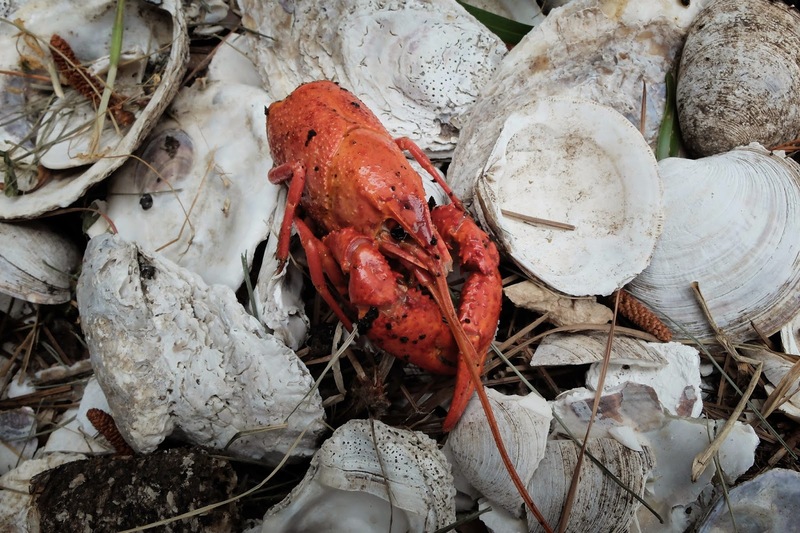 I never get photographs of a crawfish boil. I always intend to do so, but then I've got the big oven mitts on to handle the big pot of boiling water and spices. Or a beer in one hand and a plate of crawfish in the other. Or I'm explaining to someone how to peel a crawfish, or just trying to keep track of time so that the mudbugs are steamed by their own heat in a cooler with a layer of spices thrown in to get the flavor just right. So like Bigfoot, I took a few shots of what might have been. Something must have happened. The beer, the wine, two side of salmon and twenty pounds of crawfish couldn't just vanish into thin air. Or could it? batch of crawfish, there is no better place to get them. the folks that arrive late will be upset to find it all gone. FedEx tells me the crawfish are on the way. we'll see what it looks like in a few hours. I have dualing "to do" lists these days. One for the spring sailing trip, which starts in about 10 days, and another for the annual crawfish boil which is just three days away. 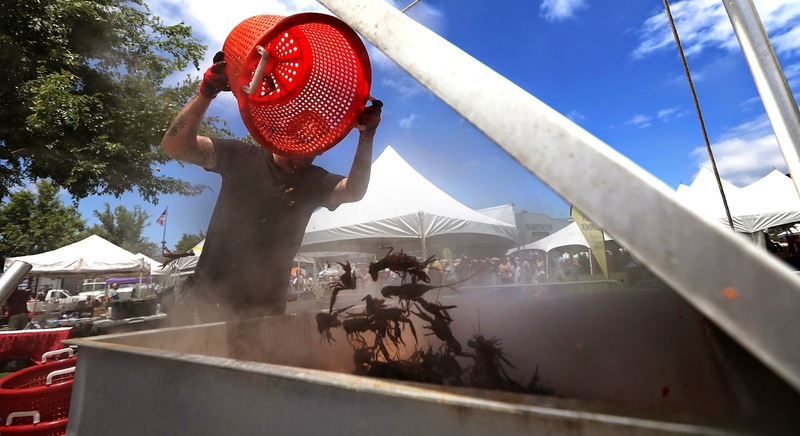 One list says "change outboard oil," the other says "pick up two sides of salmon, brown sugar and salt" for the smoked salmon that will be served alongside the crawfish. 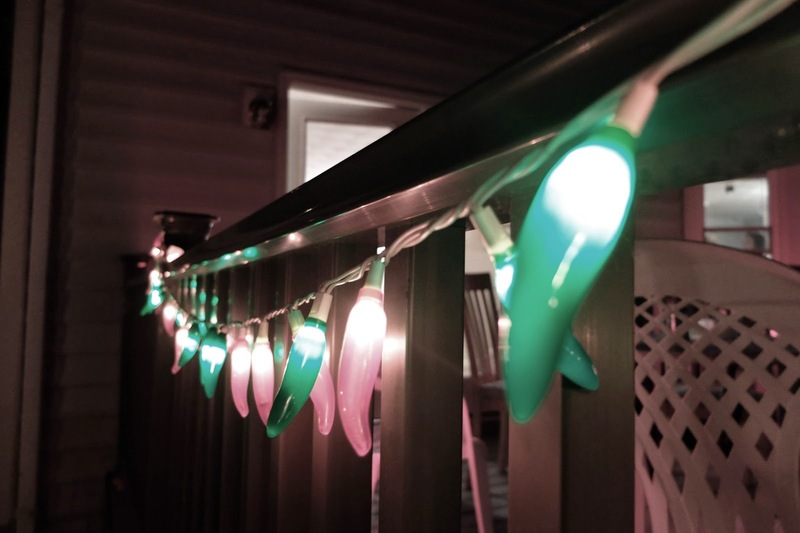 I received two solar powered inflatable lights from Amazon yesterday, one for Spartina and one for the house. Like all good equipment ideas, the suggestion of the lights came from my kayaking friend Kristen. It was only when I was emailing with her about lights the other evening I realized there were in fact two manufacturers and I had chosen a slightly different lamp than the one she uses. I purchased luminAID lamps, she uses the Luci solar lamps. They are similar, though the Luci is more elegant looking while the luminAID has a more utilitarian design. They cost about the same and are both available at Amazon. 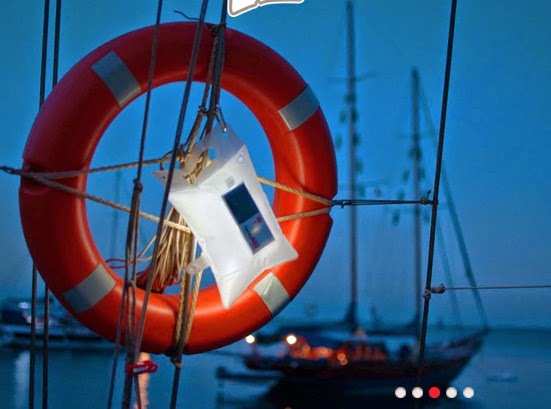 The solar powered inflatable (and inexpensive) lamps were designed for third world use, where electricity is often not available, and for disaster relief situations. 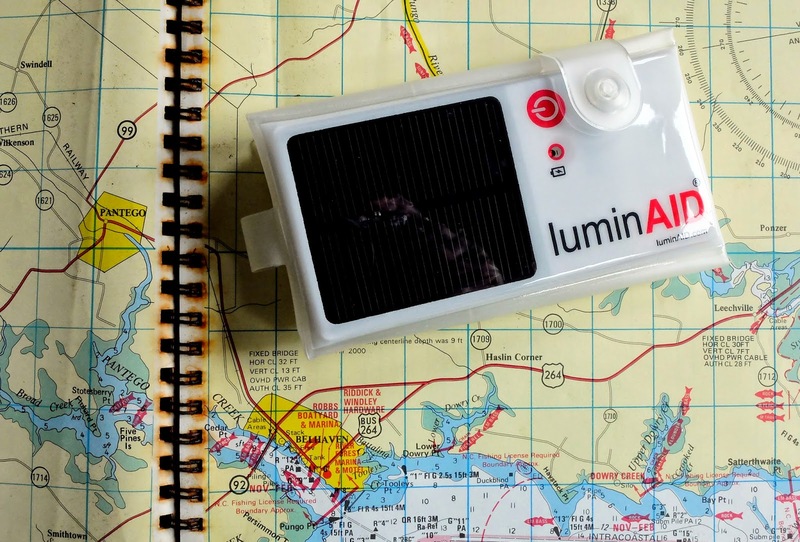 The luminAID lamp, when deflated and folded, is pocket sized. The small solar panel charges the battery in seven hours, storing enough energy to provide light for up to 16 hours. When in use the lamp is inflated, making a small "pillow" that glows. The lamps are waterproof and will float. Pretty cool. I'm not sure where I will store the solar lamp on Spartina. 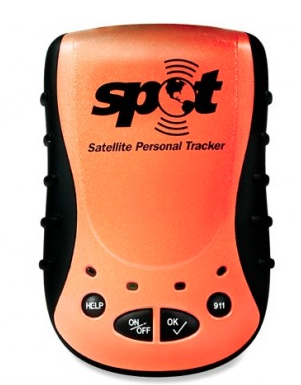 Maybe in the light kit, with the other flashlights and notebooks. Or maybe in the survival kit. I see it as a piece of emergency gear - either to provide light for myself or to attract attention. And like all good emergency gear I may never use it, but will always be glad to have it on board. 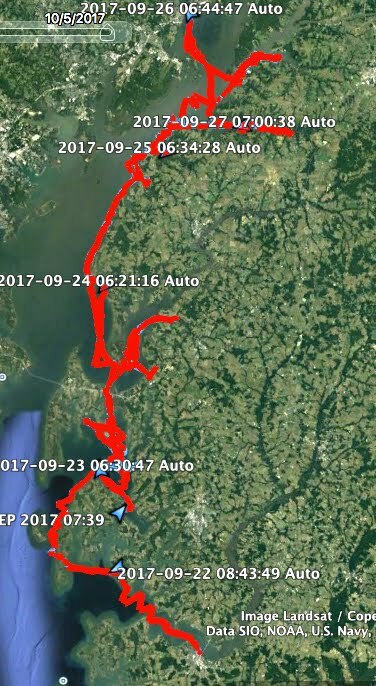 I've been making headway with my other tasks - updating the SPOT profile, organizing food in the plastic jars and checking my gps waypoints. I will get more serious about packing starting Monday. In the meantime, I will be focusing on the crawfish boil. A bunch of friends, not to mention 300 live crawfish from the swamps of Louisiana, will be here soon. Realizing that the spring trip is less than two weeks away, I've begun packing the food - most of which I had already bought. Tuna fish salad with crackers for lunch, granola bars for breakfast and freeze dried meals for dinner, each accompanied by a cup of fruit. A two pound box of dried medjool dates arrived from Amazon the other day, along with a couple of new batteries for the Pentax Option W-90. I bagged the dates for each day, five to a sandwich bag for snacks (which might be more than I need, but they are like candy - healthy candy - to me). Locally I will buy more dried fruit - mango slices, pineapple, kiwi fruit and maybe some banana chips. And I do need to pick up eight one-gallon bottles of water. 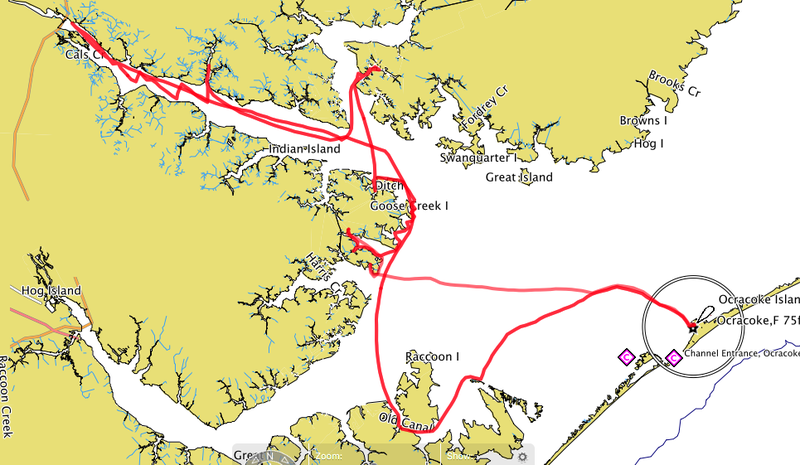 The trip, now that we've settled on North Carolina waters, is becoming a bit clearer in my mind. 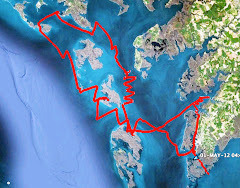 I'll treat this as a walkabout, no set in stone plan and just going where and when the wind will take me. 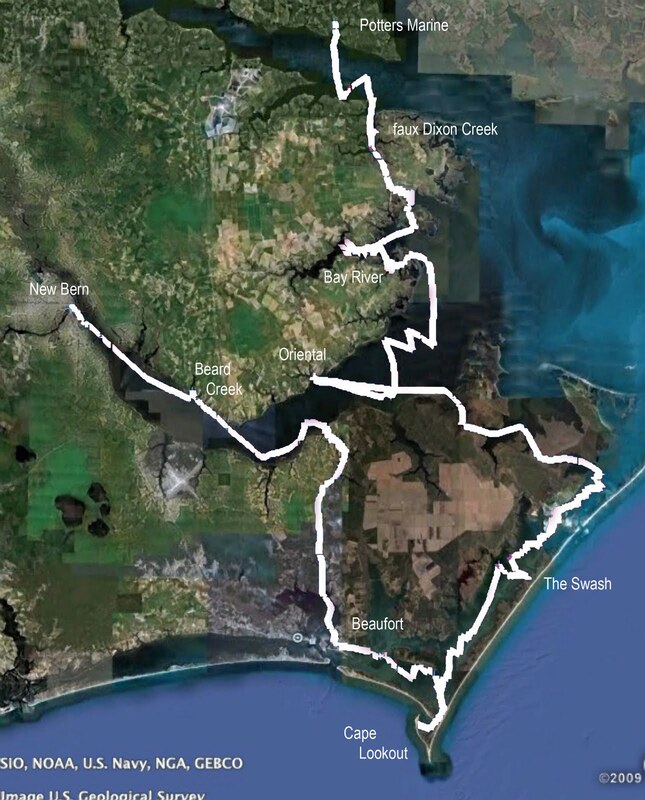 It will be a counter clockwise trip around a part of mainland North Carolina, made up of wildlife refuges and farm land. The sketch above shows options for different paths, options that will be chosen by weather and how I feel on a given day. 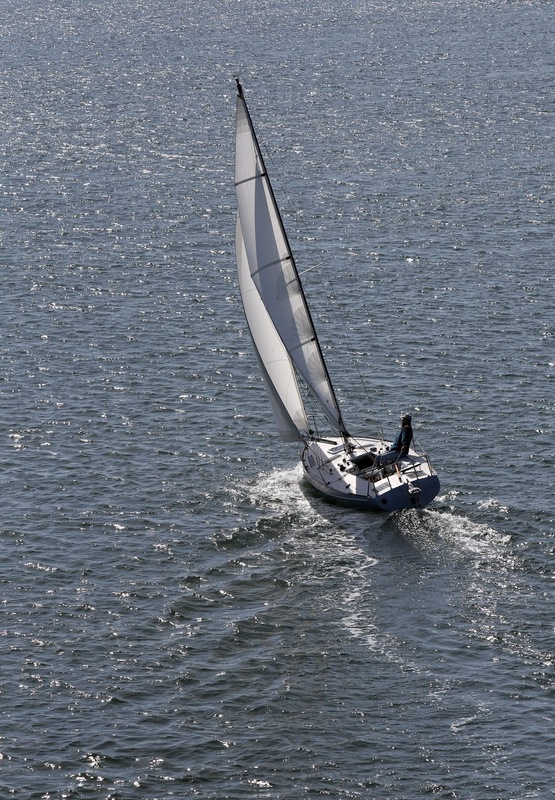 I hope for better sailing on the Alligator River and maybe anchoring in the rivers' Rattlesnake Bay. A visit to Belhaven is a must. 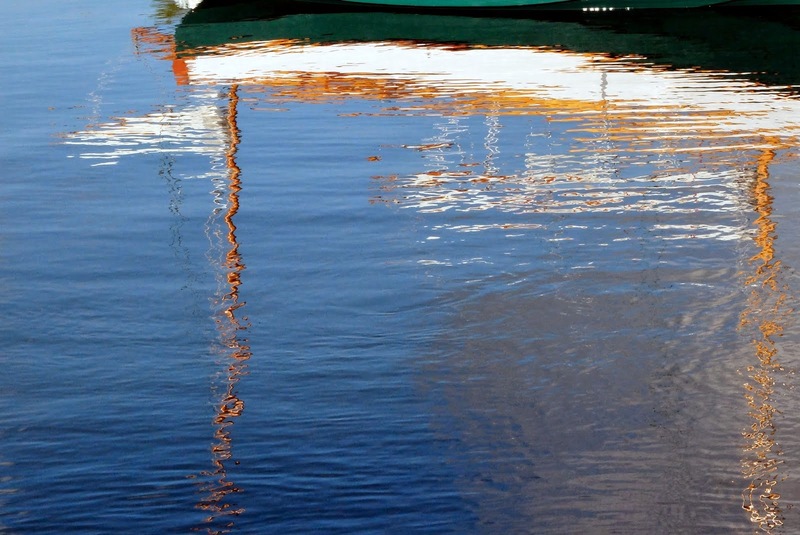 I would like to anchor in Mouse Harbor, which I haven't visited for a few years. 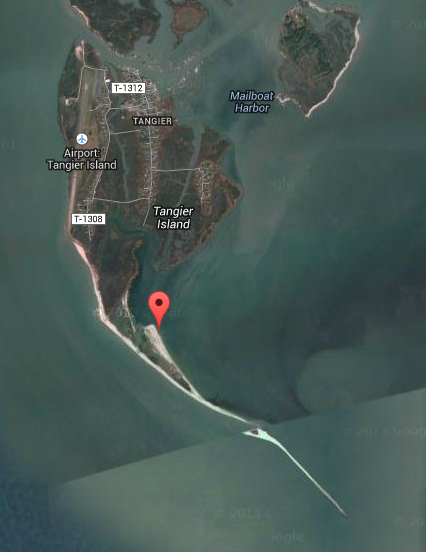 Mouse Harbor is also, with the right wind, the perfect spot to head to Ocracoke Island. 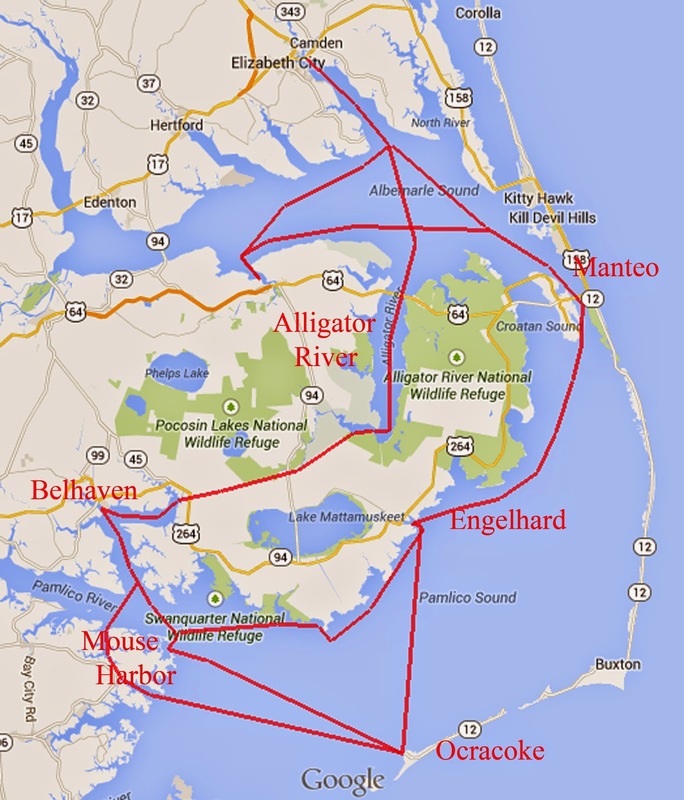 I would like to visit Manteo on Roanoke Island, and maybe the sister village to the south, Wanchese. 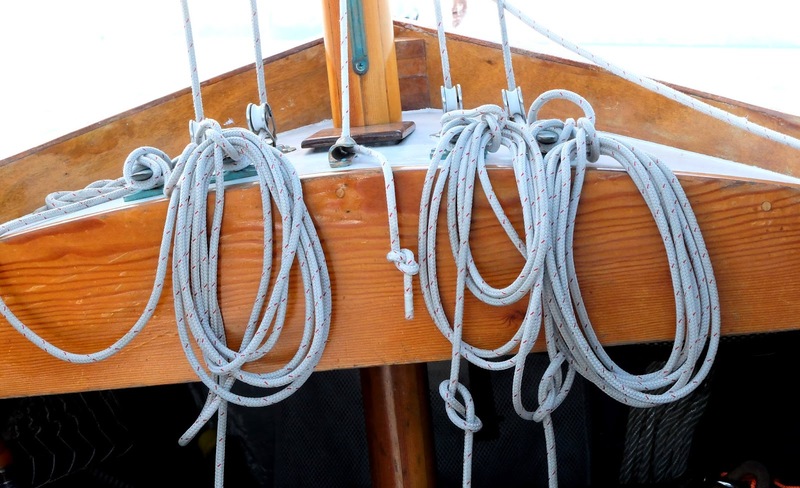 I've got ten days to be on the water, plus two more if I need to use them. I just rec'd a SPOT email from Curt, who is returning from the annual Chesapake Float with Barry, Kevin, Mike and a handful of other sailors. 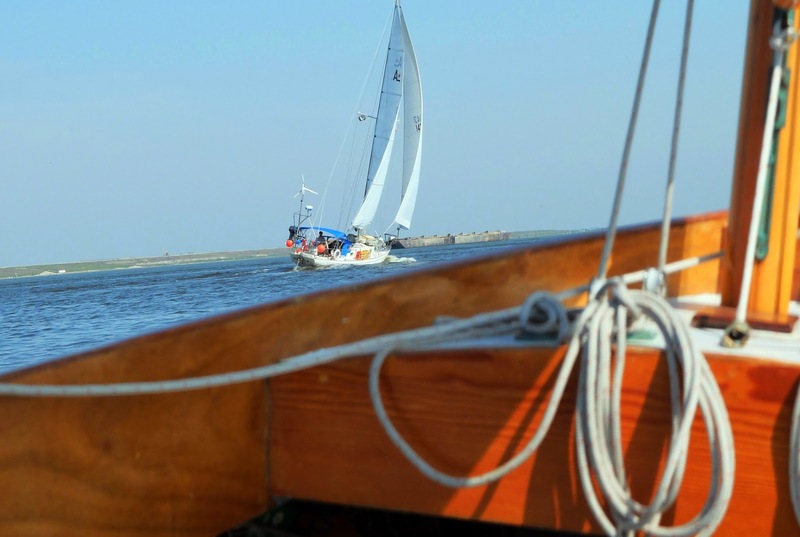 Curt is anchored for what must be a great afternoon and wonderful evening in the little sand hook known as Cod Harbor at Tangier Island. 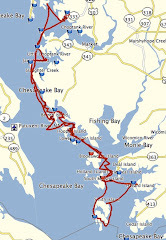 There are a lot of nice anchorages on Chesapeake Bay. In my opinion this is one of the best. Enjoy, Curt! 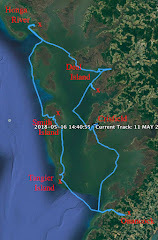 The first inkling of trouble came when I checked the Star Transit time schedule for their orange line runs from Accomac to Chincoteague. 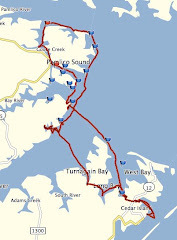 I had come across the Eastern Shore bus system last year and thought it would be a perfect way to get from my destination of Onancock back to Chincoteague where I planned to leave the jeep and trailer. Just a few dollars, one bus transfer and less than two hours would get me from one place to the other. Checking the schedule last week I found that the orange line had disappeared. A little further research found minutes of a meeting where the orange line was discontinued due to lack of funding. My needs, apparently, did not come up in the board discussion. 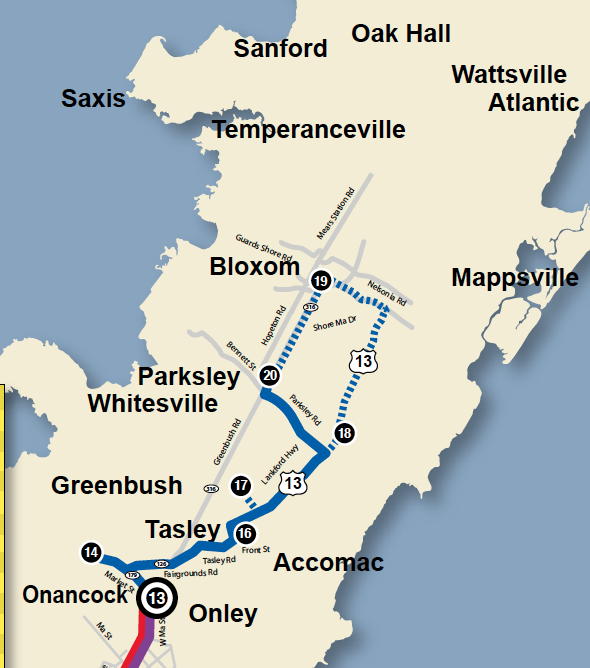 So I called my friend Maria, who lives in Onancock, asking if anybody ran a taxi service in the area, maybe something out of a garage or gas station. She replied back that there was no such service, but she would be glad to give me a ride back to Chincoteague. How nice of her. 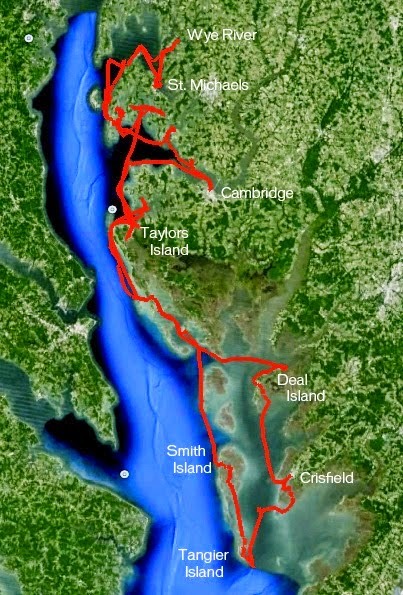 So I'm thinking I'm back in great shape until I get an email from the dock master at Onancock telling me the ramp was in bad shape due to both age and this winter's ice. It will be closed for repairs for at least a few weeks. 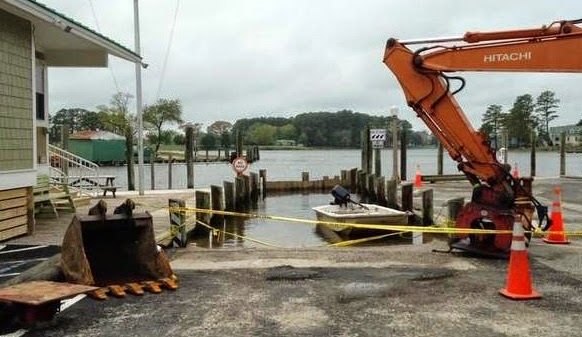 The Eastern Shore/Chesapake will have to wait until this fall. The offer of a ride, I'm told, still holds. North winds, needed for the first couple of days sailing down the ocean side of the shore, might be more prevalent. My next phone call was to friend Millie, who lives in Elizabeth City, NC. She let me leave the jeep and trailer at her place for last fall's trip, and said she would be glad to do so again later this month. 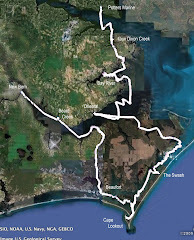 Maybe Elizabeth City to the Alligator River (hopefully not hidden in fog and rain), down the canal to Belhaven and the Pamlico River, with luck a crossing to Ocracoke and then north to Roanoke Island and back home. Or something like that. Yes, blue crabs do shed their shells in North Carolina water too, but for some reason they are not as commonly served in restaurants. But I do know where I can get a good trout burger. Hot, gusty winds out of the west. On the Norfolk waterfront this morning. Or maybe it was "piracy."